Does your dog love to chew on everything? If you said yes, then you are going to NEED a tough collar that can stand up and take an endless amount of punishment no matter what. When it comes to finding a collar that can’t be chewed through, it can be somewhat of a challenge to come across one that is extremely durable and can take an seemingly endless amount of pressure. Dog collars are typically made in a plethora of different materials some of the most popular ones being leather, nylon, polyester and cotton. After using each of these materials it was of course easy to see that a high-quality leather was definitely the best option that offered the strength to prevent it being chewed on and becoming tore apart over time. 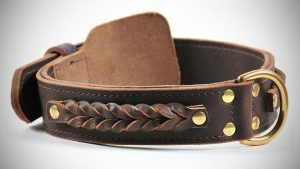 I have used of host of different leather collars to find which one works best to stop your dog from ever chew through it. Below are the toughest dog collars on the market. When it comes to finding a high-quality leather that is strong and can take a lot of punishment this Dean and Tyler offering is definitely one of the best. It is made from a double ply leather which massively strengthens the collar and makes it absurdly strong. It also has studs which also help strengthen it even further. So when it comes to durability this is top of the line. The metal is made from brass – it really stands out and looks and feels great. The only downside with this one is that its only available for sizes of neck 22 inch to 26 inch. So if that isn’t the best fit check out our other recommendations below which offer many more size options. It’s also available in black and a lighter color. 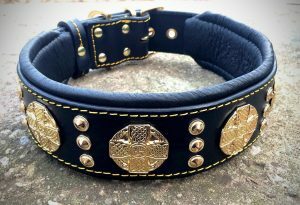 This Bestia collar not only looks amazing but has so much strength and durability in the leather itself. It is made from buffalo leather which is one of the strongest upholstery known out there. Its overall strength and elastic properties give it extreme resistance to ripping. On the inside of the collar is well padded with an extremely well cushioned and comfortable leather material. The collar is studded which strengthens the collar even more. 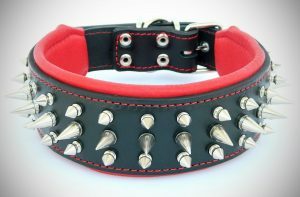 If you are afraid that your dog may bite through literally anything a great thing to stop them all together or put them off is to have this design with the spikes, not only does this precent them from chewing but it looks really cool as well. This is the made from Bestia just like #2, so this means the same level of durability and strength along with great comfort. Once you have tried one of their products yourself you will immediately see the amazing quality of the products thanks to the top notch materials that they have used along with superb craftsmanship. The lining color and stitching is available in a few different color options – red, white, black and brown, my personal favorite being the red it looks incredible. It also is available in host of different sizes so you can find the appropriate size too. This is the best unchewable dog collar out there! Don’t forget to check out our article on the toughest dog leashes.